The samartan PAD resists shock and vibration and carries an IP56 rating, the industies highest rating against dust and water. 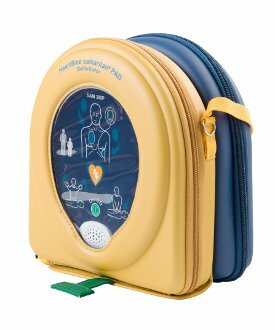 It can be taken and used virtually anywhere, even in the most inclement conditions. It also carries a 7 year unit warranty. 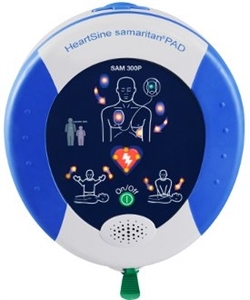 User friendly - The samaritan PAD features easy to understand visual and oral prompts that guide a user through the process. 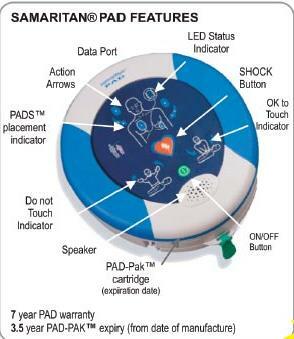 Two button operation - Only two buttons, ON and SHOCK, are required, providing straightforward operation. Always ready - A system status ready indicator flashes to show that the complete system is operational and ready for use. Divice automatically runs self check each week.